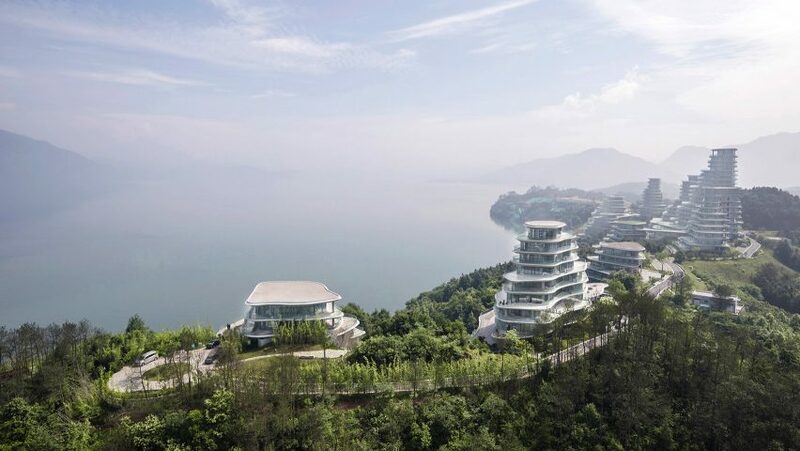 MAD has built a cluster of housing towers in China's Anhui province, which take their forms from the granite contours of the Huangshan mountain range. Ten housing blocks make up MAD's Huangshan Mountain Village. The floorplates of each one decrease in scale towards the summit, tapering to create a peak-like formation along the edge of Taiping Lake. The development is located in picturesque Huangshan, near the ancient villages of Hongcun and Xidi, both UNESCO heritage sites. 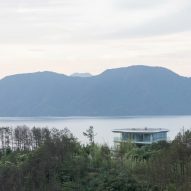 Designed for the property developer Greenland Hong Kong Holdings, it forms part of a wider masterplan for Huangshan Taiping Lake, which will provide facilities over a 100-hectare site at the popular tourist destination. 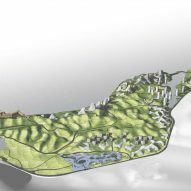 The design is based on the Shanshui City idea, an architectural concept created by MAD's founder Ma Yansong, which takes its inspiration from Chinese landscape paintings. 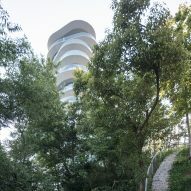 It aims to help inhabitants reconnect with the natural environment. 'The impression we have of Taiping Lake in Huangshan is vague: each visit to this place yields different views, different impressions," said Ma. "It is a bit mysterious, like ancient Shanshui landscape paintings that are never based on realism, but rather, the imagination. This inexplicable feeling is always poetic; it is obscure and indistinct." 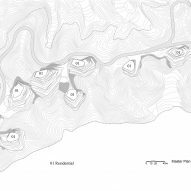 "This is the basic idea: we hope that residents will not just look at the scenery, but see themselves in relation to this environment, attention that is brought inward. In observing oneself, one perhaps begins to notice a different self than the one present in the city," he added. 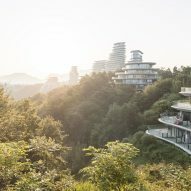 Wavy balconies surround each glazed floor, informed by the area's mountainous topography and terraced tea fields. The undulating formation means no two apartments are the same. The blocks are linked by pathways that meander through woodland. 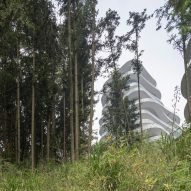 "Composed in deference to the local topography, each of the buildings are diverse in height and appearance, and have been conceived to ensure that the original mountain levels are maintained," explained the studio. 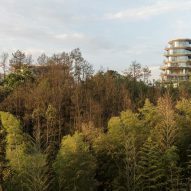 "Organised in a link configuration across the southern slope of Taiping Lake, the dynamic relationship that is created among the 10 buildings establishes a new type of village landscape: one where architecture becomes nature, and nature dissolves into architecture," it added. 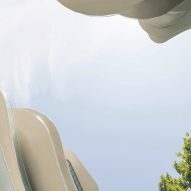 Beijing-based MAD first unveiled designs for the 69,600-square-metre development back in 2012. 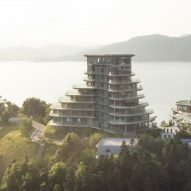 It is the latest in a series of mountain-inspired developments by the studio. Last year the firm completed a section of Fake Hills – an apartment complex in Beihai with an undulating roofline that accommodates tennis courts and swimming pools. 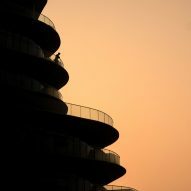 And work is nearing completion on Chaoyang Park Plaza in Beijing, which is based on mountains, rocks and lakes found in traditional Chinese shan-shui paintings. Photography is by Laurian Ghinitoiu.